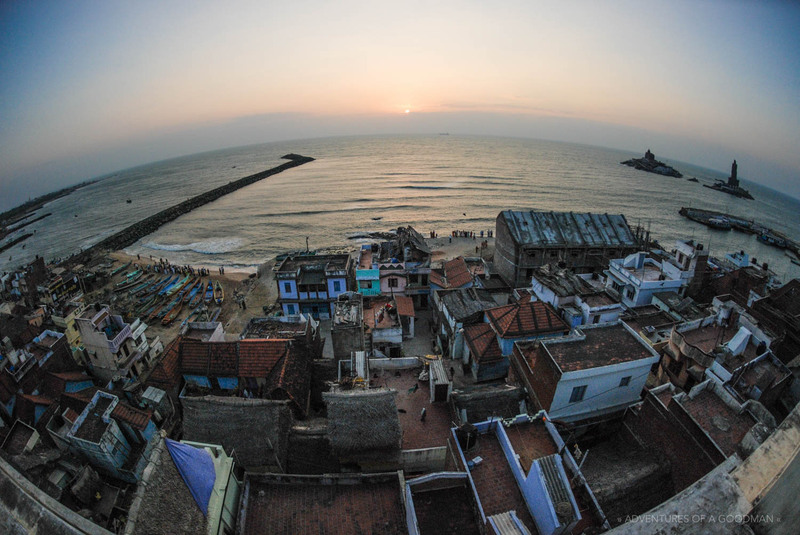 Just under two months into our trip we hit Kanyakumari and the southernmost tip of India where the Arabian Sea, Bay of Bengal and Indian Ocean meet. In our one night there we watched the sunset over all three bodies of water, saw the place where Gandhi’s ashes were laid to rest before being swept out to sea and enjoyed the view from our amazing balcony. The room we stayed in — number 408 at the Lakshmi Tourist Home — was actually recommended, by number, in our guidebook. The next morning I woke up dark and early to watch the sunrise over the same three bodies of water from our rooftop. It was beautiful, but due to a layer of haze I didn’t actually see the sun until it had been above the horizon for nearly 20 minutes. A few hours later it was time to check out and begin our trip to Kodaikanal. Most towns have countless tourist offices where you can book tours, trains, buses or just get general information. After asking four such offices for the bus schedule and getting four different answers, we headed to where one of them told us the bus station was. Naturally, after a long walk in the blazing sun with our giant backpacks, we learned that the bus stop was actually right up the street from the tourist office. Uuuugh! Hot and sweaty we tried to get a rickshaw to take us the 2 kilometers to the bus station but they all were charging obnoxiously high prices so we waited for the local bus into town that would end its trip at the station. Naturally, even the bus found a way to overcharge us, which I realized when I looked at the sign right in front of my face listing distances and fares. Tired and not wanting to deal with making a scene over a few cents, I forced myself to bite my tongue. As is often the case, any minute really meant in about two hours. So, after killing time eating a bus station breakfast (fried food, soda and chips) we finally got on the road for our worst bus ride to date. Cramped, bumpy, hot and loud are words that come to mind to describe it. We spent much of the ride squeezing locals into our row of seats that was barely big enough for the two of us including a few hours with what we guessed was a 6 foot 3, 240lbs man. The bus helper was also sitting right next to us and his job was to blow a loud whistle every time we had to stop to let someone on and off (which happened at least every few minutes as we were on a local bus). Suffice it to say, it was among the longest six hours ever during which I spent lots of time just wishing I was back home.